The Higgs field: so important it merited an entire experimental facility, the Large Hadron Collider, dedicated to understanding it. This mysterious field is on average non-zero, suffusing the universe almost like an invisible fluid, affecting the masses of the known elementary particles. What if it were zero on average instead? What would the world be like then? Fig. 2 from previous article:The particles, with the interactions among the known particles shown as lines. The non-zero Higgs field (green swath) makes the known particles massive, and the Higgs field and Higgs particle have stronger interactions with the heavier particles. Well, it would be lethal for us — atoms wouldn’t exist —- but in a certain sense, it would look much simpler, and much better organized. Let’s see how. Take Fig. 2 from this earlier article about the known particles [which I recommend you read first, if you haven’t already.] This figure shows the known elementary particles of nature (plus the conjectured Higgs of the Standard Model) and the lines indicate which particles directly affect one another. You see three of the four known forces of nature (gravity is left off to avoid clutter): the strong nuclear force (with gluons as force carriers), electromagnetism (whose force carrier is the photon) and the weak nuclear force (with W’s and Z as force carriers). And you see that the neutrinos, charged leptons and quarks do not interact directly with one another; they are directly affected only by the force carriers. And finally, the Higgs field, which is non-zero in our universe [you might want to look at these video clips for more info], and is indicated by the green swath, affects all of the known massive elementary particles, and in fact is responsible for making them massive. 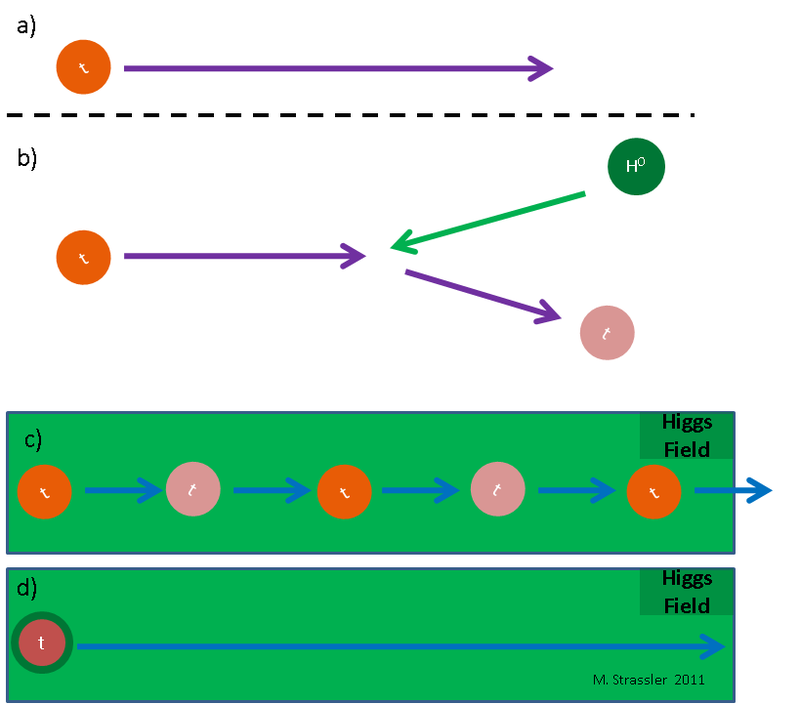 Fig.3 : If the Higgs field were zero, the matter fields would be rearranged, as would be the forces and force carriers. None of the known particles would be massive, though the Higgs particles (of which there would be four, at least) would be massive. As part of this scrambling, the force carrier particles are changed; there are 3 W particles and an X particle, and the Z0 and photon are missing. And the W and X particles are all massless now. The force carriers are now simpler in another sense. The photon affects the W+ and W– particles directly; you can see that in Fig. 2, where they are connected by a purple line. But the X particle does not directly affect any of the three W particles. The gluons affect themselves as before (the red curved line); the W’s affect themselves too; but the X particle affects no force carriers at all. Notice that the left-particles all come in pairs, one pair for each generation (a term defined here), and are affected by the isospin force. The electron comes with the neutrino-e (or “electron-neutrino”), the up quark comes with the down-quark, etc. But the right-particles come singly, one for each generation, and are not affected by the isospin force. There are only neutrino-lefts; there are no neutrino-rights. In Figure 1, I used the labeling neutrino-1, neutrino-2 and neutrino-3 for the neutrinos, but in Figure 2 I use labels that correspond to the names “electron-neutrino”, “muon-neutrino”, and “tau-neutrino”. This is a subtlety you can ignore unless you are really interested in it, in which case you should read this article. How did the non-zero Higgs field alter this simpler and better-organized (but uninhabitable) world and turn into the complicated one that we live in (Fig. 2)? It all has to do with how the Higgs field interacts with the isospin and hypercharge force carriers and with the matter particles. How this works for the top quark, as an example, is sketched in Figs. 4 and 5. The top-left quark and the top-right quark interact strongly with each other and the Higgs particle… and not with other matter particles. In particular, if a top-left quark encounters a Higgs particle, it can turn, with high probability, into a top-right quark. Once the Higgs field is non-zero, this type of interaction causes the two versions of the massless top quark to become a single massive top quark, with a large mass. Fig. 4: The top-left and top-right massless quarks interact strongly with the Higgs field; when the Higgs field becomes non-zero, a very massive top quark results. This linking of the top-left and the top-right is not to be confused with the binding of two particles into a composite object, as a proton and an electron are bound together by the electromagnetic force to form a hydrogen atom. It is a different kind of combining, in which two elementary particles are mixed together into a single elementary particle. Fig. 5: (a) The top-left is massless and travels at the speed of light. (b) Should it bang into a Higgs particle, it can easily turn into a top-right. (c) With the Higgs field non-zero, the top-left and top-right continually are flipped back and forth, which causes them to travel below the speed of light, and gain a lot of intrinsic energy. (d) It is convenient to think of this extra intrinsic energy as the mass-energy of a very massive top quark, and view this peripatetic flip-flopping of top-left and top-right as the normal state of this top quark. How does this work? Fig. 5 shows a sketch. When the Higgs field is not zero, a top-left particle would travel at the speed of light, alone. The same would be true of a top-right. But when the Higgs field is not zero, its presence, and the fact that it has a direct interaction with the top-left and the top-right, forces the top-left to convert over to a top-right, and back again. How often does this happen? About a 100 trillion trillion (100,000,000,000,000,000,000,000,000) times a second. This conversion process makes it impossible for us to think of the top-left and the top-right as separate particles, because they are inextricably linked together; if you have one, you will very soon have the other. (You never have both at the same time, which is why the top quark remains elementary, not composite.) We call this mixture of these two particles the top quark, collectively. And the non-zero Higgs field, whose presence causes the flipping back and forth between top-left and top-right, endows this mixture with an additional intrinsic energy, even when it is sitting still. That intrinsic energy is indistinguishable from mass-energy (E=m c-squared energy); it behaves the same way in experiments. In other words, what we call the mass-energy of the top quark is really, if you prefer, the energy it picks up when sitting in a non-zero Higgs field. Take the Higgs field away — make it zero — and the top quark goes back to being two separate massless particles, the top-right and top-left. The same phenomenon makes the electron massive too, but the interaction of the Higgs field with the electron-left and the electron-right is very weak, and so the electron, in the presence of a non-zero Higgs field, is massive but still relatively lightweight. The flip-flopping between electron-left and electron-right happens only .000003 times as frequently as for the top-left and top-right, and it follows (from a little bit of mathematics) that the electron mass is .000003 the mass of the top quark. Fig. 6: As in Fig. 4, the massless electron-left and electron-right become a massive electron when the Higgs field becomes non-zero, but because their interaction with the Higgs is feeble, the electron remains lightweight. All the other quarks and charged leptons get their masses in a similar way. The stronger the interaction of the left- and right- object with the Higgs, the larger the mass that results for the mixed object when the Higgs field is non-zero. What about the force carriers? The Higgs does not affect the gluons, but it rearranges the isospin and hypercharge forces, making the photon out of a mixture of the W3 and X, the Z0 out of a different mixture of the W3 and X and the Higgs particle called the A0, and the W+ and W– out of mixtures of the W1, W2, the H+ and H–. [Warning: very small white lie here, a technicality important mainly for experts; will fill this in in a supplementary post.] This process, called the Higgs Mechanism, makes the W+, W–, and Z0 massive, leaving the photon massless. Aha!! So that’s how a non-zero-Higgs-field world ends up with 1 Higgs particle (the h) whereas a zero-Higgs-field world has 4, the H+ and H–, A0 and H0. Similarly to the mixing of top-left and top-right to make a massive top quark, the three extra Higgs particles end up mixed with the three mixtures of the massless W’s and X particles to make the massive Z0, W+ and W–! Fig. 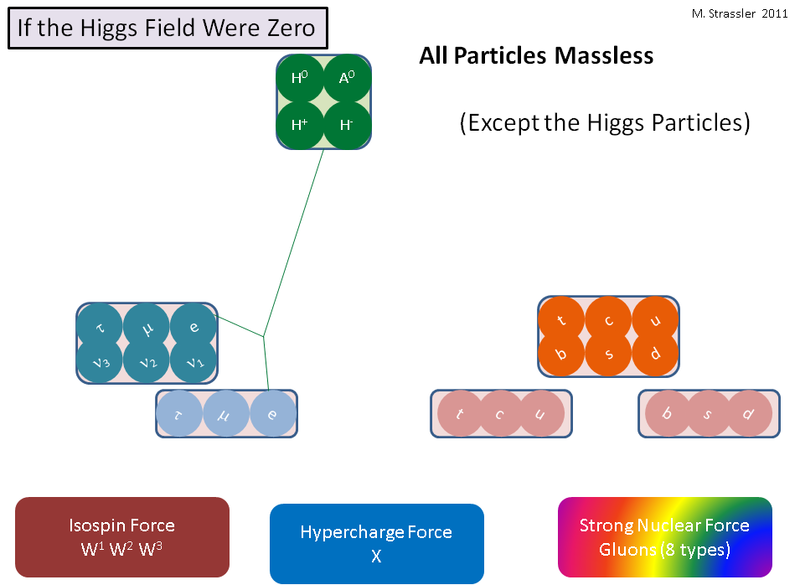 7: The non-zero Higgs field mixes the massless W and X force carriers and the Higgs particles, making three of the force carriers massive, leaving the fourth massless, and retaining one massive Higgs particle from the initial four. 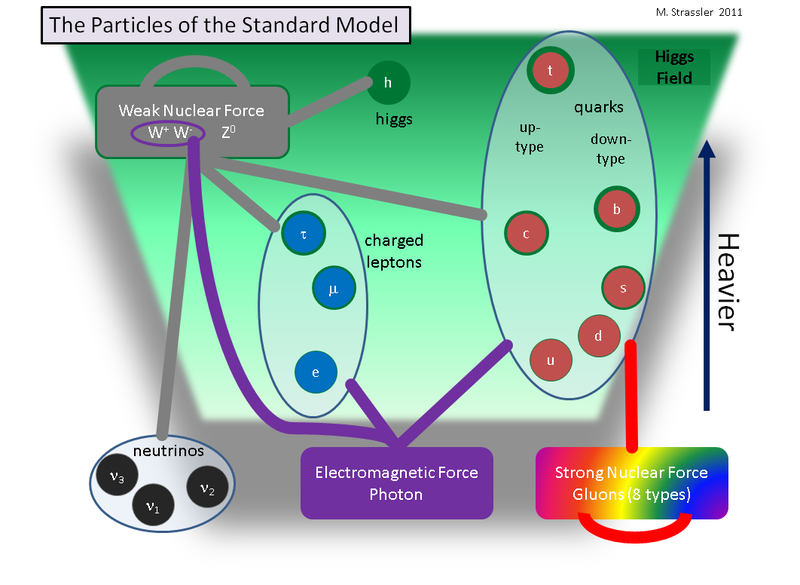 This is what happens in the Standard Model; the number of Higgs particles in nature may be different from shown. But the core idea --- that three Higgs fields combine with the massless W's and X to form the massive W's and Z --- is already well-established, using existing data from the past three decades. A force whose force carrier is massive turns out to be ineffective at long distances, and this is why the weak nuclear forces seem so weak to us. If the Higgs field were zero, the isospin and hypercharge forces would all be comparably strong. Instead, our world has a rather strong electromagnetic force with a massless photon as carrier, and a weak nuclear force that is so weak that our daily lives are little affected by it — although admittedly it is essential in the internal furnace of stars, including the sun! The reason that the world looks so complicated, with all those particles with wildly different masses, is partly that the Higgs field and Higgs particle interact with the different matter particles with such different strengths. The problem of diverse particle masses thus is actually a problem of their diverse interaction-strengths with the Higgs field/particle. Why are these interaction strengths so very different? There is no consensus as to the answer to this question (which particle physicists call the “flavor problem” — referring to electrons, muons and taus as different charged-lepton flavors, and similarly for quark flavors). We hope the Large Hadron Collider might give us some insights here, but there is no guarantee that it will. I’ll end with an important point, one which I hope you’ll find interesting. Many people (including aspiring physicists) assume, when they first encounter the story of the Higgs field, that it must be connected with gravity, which also engages heavier particles more strongly than lighter ones. Gravity pulls on top quarks harder than it pulls on electrons, and so do Higgs forces. But experienced physicists reject this notion. Why? By contrast, only those particles that get their masses from the Higgs field have a relationship between their masses and the strength of their interactions with the Higgs. In particular, as you can see in Figs. 3 and 7, the Higgs particle itself does not get all of its mass from the non-zero Higgs field — and the strength of its interaction with itself is not directly related to its mass. [There is a correlation, but not proportionality.] This is not unusual. In other articles on this site, you will see many other examples of conjectured particles, such as those that arise in the speculative theories known as supersymmetry and as warped extra-dimensions, that get their masses in other ways. So the link between gravity and energy (and thereby mass, in daily life) is absolute, while the link between the Higgs and mass is likely to be true only for the known elementary particles, and may not be true for other elementary particles yet to be discovered — and is not even true for the Higgs particle itself. In other words, any resemblance between the Higgs field and gravity is purely coincidental! Hello Matt, nice blog you have going here. The “hypercharge force” B there is your X, and its interaction lines roughly indicate that Y is a combination of W’³ and B-L.
Garrett — your table is elegant, but to avoid confusing the public you might want to indicate somehow that the existence of the neutrino-right particles is speculative. Normally we do not consider such hypothetical particles part of the Standard Model — they would be considered (by convention only) Beyond the Standard Model. The only hypothetical particle in the Standard Model, as most physicists refer to it, is the Higgs particle. Does the QCD condensate contribute strong scale masses (of order the pion decay constant) to the Ws and Z or is it entirely the Higgs? Again, this is way too advanced for this article. The answer, however, is neither yes nor no. Effects of the strong nuclear force do indeed generate a Higgs-field-like effect, and so the statement that the W and Z particles would be massless in a zero-Higgs-field world is a small white lie. (Thanks for reminding me that I should say that somewhere!) However, you have to recalculate everything carefully — and you would find, after recalculating, that the strong nuclear force would be weaker than it is in our world, so the effect would be much smaller in such a world than it is in this one. More generally, when you have two Higgs-like fields —- in the current example, the Higgs field itself and this “QCD condensate” that you refer to — then they must be combined not linearly but in quadrature: the mass of the W is the square root of the sum of the squares of the two Higgs fields. That means that the effect of the QCD condensate — this second Higgs-like field — on the W and Z masses is about one part in a million — dwarfed by other effects, and far too small to measure. Good article! In the 0 Higgs field world what is the property that is different between the left particles and right particles? For example what has to be changed by the Higgs interaction to turn an electron-left into an electron-right? The main difference is the one you see in the figure: the electron-left and neutrino-1-left feel the weak-nuclear force while the electron-right does not. Also, though I didn’t emphasize it, the electron-left and electron-right have different hypercharge — even though they have the same electric charge after the Higgs field is non-zero. When you ask, “what has to be changed by the Higgs interaction” — that’s not really the right question, I think. The Higgs field rearranges pretty much everything all at once to make the world the way it is. I’m not really sure I’ve satisfactorily answered your question. Feel free to re-ask it. Based on a little Google research, I think the answer to what is different between the electron-left and electron-right is chirality. Please let me know if that is correct or not. After a little thinking, I can see that the whole concept of the Higgs field is extremely important. If not for the Higgs field giving them effective mass, particles such as electrons, quarks, and whatnot would be zipping around at the speed of light. Due to relativistic effects, these particles would not experience time passage and space passage. So it seems we experience time and space itself because of the Higgs interactions. Am I close on this assumption? You are correct. The only tricky bit with the term chirality is that it is not helicity (which you can measure physically). I have to emphasize to my particle physics students that helicity is the thing that you colloquially might call chirality as you use it, say, for molecules. Chirality turns out to be something more mathematically subtle. For massless particles chirality and helicity are the same, but not for massive ones. So be careful putting too much weight on the term. Oh, and about us experiencing time and space because of the Higgs — not really wrong, but on the other hand if the Higgs field’s average value were zero, and electrons were massless, there would be no atoms, and probably little structure of any kind in the universe, so we would have some other problems experiencing space and time! You said “For massless particles chirality and helicity are the same, but not for massive ones.” so, when a massless non-zero-spin particle (=photon, gluon and whatnot) bounces off a mirror etc. it changes its helicity and chirality(=spin direction with respect to the particle’s traveling direction) from -(+) to +(-) along its traveling axis, and you can always tell if it has either a left or right spin, correct? But for a massive one, its helicity depends on the reference frame(=its helicity changes depending on the relative speed/direction between the massive particle and an observer(reference frame/an object etc.))? A massive non-zero-spin particle cannot always be differentiated by left or right spin (but can be differentiated if it has some kind of non-symmetric (internal?) structure?) And, the direction and scalar amount of angular momentum of both massive and massless particles are always conserved alike under any interactions/conditions? Are these all correct? Thanks for a nice clear explanation of how the Higgs mechanism works. That’s the first time I’ve seen it explained without lots of handwaving and very soft analogies! Could you say a little more about how/why the interaction with the Higgs “endows this mixture [of top-left and top-right] with an additional intrinsic energy”? Is this something special to the Higgs mechanism, or just a general fact that interactions endow particles with energy? Hmm… I am not sure I can do it without a whole section on how mass and energy work in quantum field theory. It’s not so easy to explain without equations — though the required equations are simple. I do intend to write an article on mass and energy, and I’ll try to fill in this pedagogical hole. A mass energy article would be very useful. Am I correct in suspecting that mass of a volume of space is nothing more than energy confined within that specific volume? In other words, mass as a separate entity from energy doesn’t exist. It is the same thing. I have one planned and half-sketched. Mass and energy are very different things, in fact, and it is not true that the mass of a volume of space is simply the energy within that volume. But the subject is tricky enough, and important enough, that I’m trying to make sure I address all of the important subtleties properly before putting the article up. Stay tuned; it will appear. Is it possible with a 2,000 trillion electron volt Large Hadron Collider to brake the Higgs field by smashing different bosons together? What points of this article must be rewritten if the Higgs particle (both 1 and 4) is ruled out (that is, no interaction with the Higgs)? Your question could mean two things. Do you mean to ask about how the article would change if the Standard Model version of the Higgs particle is ruled out? If so, the answer is that the Higgs sector may be somewhat more complicated, with more Higgs particles, or perhaps a whole new set of particles and forces. The truth will be determined from experimental data. The details of the Higgs sector will change, the basic structure of the relation between the Higgs and the matter fields may not change that much. What voltage of a particle accelerator to strong enough to brake a higgs boson? Thanks for the quick reply. My question is “if there is no Higgs of any kind”, that is, no Higgs to interact with at all in all cases. This might be a hypothetical question. Yet, can it be addressed theoretically? Again your question could mean two things. Do you mean: no Higgs particle of any kind”? Or do you mean “no Higgs field of any kind”? These are quite different, as I’ve emphasized in the Higgs articles https://profmattstrassler.com/articles-and-posts/the-higgs-particle/360-2/ and https://profmattstrassler.com/articles-and-posts/the-higgs-particle/implications-of-higgs-searches-as-of-92011/ . I truly enjoy your posts. In addition to being a physicist, you are a good linguist. It is super important on the nitty-gritty of the semantic meaning of each term. My true question is about Higgs mechanism. For Standard Model, Higgs mechanism is the foundation for making SM meaningful by providing a mechanism to give particle its mass. Indeed, for any model, it needs a Higgs-like mechanism to provide the Higgs-effect (providing mass for particles). Thus, as long as the Higgs-effect is produced, can a whatnot mechanism be just as good as the Higgs mechanism? In your article, the Higgs mechanism gives a massless hand-particle a mass by a Higgs-ball bouncing between the Lift and Right hands in the Higgs field. I do know another mechanism which gives a massless foot-particle a mass. In the space-time sheet, there is a “step”, and this massless foot-particle is jumping up-and-down and is jumping down-and-up endlessly at this “step”. This process will give this foot-particle a mass too. While the hand-particle bouncing a Higgs ball, the foot-particle is, in fact, bouncing the entire space-time sheet under its feet. They are identical mechanism while playing (bouncing) different balls. Of course, they will be different physics. Yes, being very careful with both one’s thoughts and one’s means of expressing them is essential to being a good physicist. One has to remember that the Standard Model of particle physics, with the one exception of the Higgs particle itself, is very well-tested. The structure of the theory is very well known, and any major changes to the mass-generation mechanism for W particles and top quarks (and to a lesser degree the lighter-weight particles) risks screwing up the Standard Model’s many successful predictions. There are several mechanisms for mass-generation known in particle physics, but only a sub-class of them, all of similar type, would be consistent with existing data. And in particular, I think the Higgs mechanism for generating the masses of the W,Z and top quarks has passed enough experimental tests that it is very unlikely to be dislodged. But this refers only to the claim that some kind of Higgs field with some particular general properties has a non-zero value, and not to any of the nitty-gritty details of the Higgs field, or its particles (if any). Thank goodness! I work at a science museum, and I expect any time now to have to answer questions to the general public about the Higgs. I’ve looked and looked and looked for a non-mathematical description that didn’t use the “movie star” analogy or something equally weak. Finally, here is something I can both understand and sink my teeth into. Of course, it’s still way too much for a general public that still doesn’t know what an electron is. But at least now I can have a little bit more confidence that I understand it at a higher level than the movie star analogy. Thank you. I’ll be back to study this more fully. Thanks for your positive feedback. Let me know what you don’t understand, I’m always working to improve the site. Oh, I will. I hope you don’t get sick of me. If it helps, remember that you’re not just helping me. Think of me as a “middle man” trying to educate people even less knowledgeable than myself about why the big headlines in the newspaper matter. First question (and I apologize that you’ve started to answer this in some comments above): your description of how the top quark gains mass through collisions with Higgs particles makes me wonder why the mass doesn’t go up as speed increases (of course I know it does in special relativity, but you’re not saying that this is the mechanism of increasing mass in SR, are you? Sorry, that’s two questions). Also, why does the stationary top quark have mass at all? How is it that a stationary top quark collides with Higgs particles? OK, that’s three questions. Next question (and again I apologize if you’ve discussed this elsewhere; I’ve only just discovered your site): all this discussion of how the Higgs mechanism gives mass to the particles that make up the world seems very separated from the search for the Higgs particle. Can you give me a simple, layman’s explanation of how smashing protons together produces a particle that is representative of a field that gives those protons mass? Remembering that for most people if they have to take more than three steps, they’re lost? I’m sure I’ll have lots more questions after these, but I’d love to start here. For some reason my last post didn’t appear. Sorry if it does and this is a repeat. 1) Are you saying that the top quark in your example is in some sense colliding with Higgs bosons, causing it to flip from top-left to top-right? 2) If so, what causes the collisions for a stationary top quark? Are the Higgs particles in motion? 3) I’m pretty sure you’re not saying that this is in any way linked to relativistic mass increase. So why does a slow-moving top quark (which, I would think, will collide with more Higgs particles) have essentially the same mass as a stationary one? 4) Can you explain (or point me to another place on your site) how smashing two protons together can form a Higgs boson. Then, please explain how and why the Higgs decays to the other particles that we observe? Steve — these are good questions and deserve careful answers. As you can imagine I am a bit swamped with Higgs-related things just now — if I forget to reply within the next week, feel free to bug me. Thanks. I’ll try to be patient. But as I said, yours is the first explanation I’ve found that I think I can actually use here at the science museum. You’re my lifeline! I’ve been studying your site much more closely and I think I’ve found a good answer to the last question in your article on photon-photon detection. Very interesting and well-written. I have another question about that, but it can wait. I know you’re quite busy, but time is of the essence for me, too, if I’m to be able to explain these things to the general public. I have a thought about explaining the Higgs mechanism to laymen, and I was hoping you (or any other physicists reading this) could critique it. I think of photons as disturbances in the electromagnetic field. A good analogy might be the running lights you see on theater marquees. The lights are just flashing on and off, but the particular sequence makes it seem as if a physical object is moving around the sign. Photons are like that, in that they are a disturbance in the electric and magnetic field at a location in space, but that location is always changing in a particular direction at the speed of light. OK so far, or have I botched this? Photons aren’t affected by the Higgs mechanism, but things like electrons and quarks are. If they weren’t, they would move much like photons, disturbing their own fields (electron fields, up quark fields, etc.) at the speed of light in a particular direction. But because the Higgs field essentially weighs the matter particles down, it keeps them from propagating their fields in the way Higgs-free photons can. In my mind’s eye I see it as the Higgs reaching up and grabbing the electron (or other matter) wave. saying, “Not so fast!” We experience this weighing down as mass. I doubt that this will be a particularly useful explanation, as my sense is that it will be difficult to convince an inexperienced audience that all their particles are actually just disturbances in a field. But I wanted to know if this is at least a valid way of thinking about particles and the Higgs. I’ve never seen this analogy used, so I don’t want to use it if you or other physicists think it’s flawed. As a teacher, it’s always good to be able to explain things from different approaches. How can two flip-flopping particles, each traveling at the speed of light through the Higgs field, “average out” into a particle going less than the speed of light? Do they slow down as they oscillate into each other? How do you even get a top-left particle “alone” in a non-zero Higgs field? Wouldn’t it mix up with a top-right? I believe this is a typo and he meant to write “When the Higgs field is zero, a top-left particle would travel at the speed of light, alone.” You’ll notice he repeats “When the Higgs field is not zero” in the next sentence. When the Higgs field is zero, there’s no interaction on the top-left causing it to switch to top-right. So it would stay entirely as a top-left. Without mixing (or to be more accurate, without interactions with the Higgs field causing the mixing of states), it wouldn’t pick up any intrinsic energy and so would be massless and travel at the speed of light. As for “alone”, Professor Strassler describes a mix as being two separate particles that are literally blended into one particle (thus, not alone) but he also describes it as a single particle which switches states from left to right. I think the latter is really the better way to describe it. Similarly, he mentions that if the Higgs field were reduced to zero energy, all particles would split into two (left and right) when I think a better way to look at it is that they’d stop oscillating and remain in the state they were at the moment the energy level reached zero (and assuming this wasn’t instantaneous, the oscillations would slow too causing their masses to reduce). So roughly 50% of the particles would end up ‘frozen’ as lefts and the other 50% would be frozen as rights. Your comment about the Higgs effect being separate from gravity is somewhat mind-blowing. Do we know for sure then that the Higgs “mass” is the same as the gravity “mass” for massive (not-massless) particles? As I understand it, we believe the gravitational mass is the same as the inertial mass — but don’t really know why — and now it seems there’s another definition of mass? The mass provided by the Higgs is a contribution to the inertial mass of the corresponding particle. While Einstein’s theory of gravity implies that gravitational mass is the same as inertial mass, it also implies that gravity is more complex than in Newton’s gravitational force law, and pulls in a complicated way on energy and momentum. So the fact that many particle masses come from the Higgs field does not complicate the notion of mass. Mass is pretty simple; though it can get contributions from multiple places, they just add up. Gravity, after Einstein, is the complicated part. The question of whether gravitational mass = inertial mass has been tested to high accuracy for ordinary matter. I am not sure what the limits are for protons, neutrons and electrons separately. What an elegant way to describe the Higgs mechanism. Thanks for this site. I have a quick question. You mention the mass provided by the Higgs is a contribution to the inertial mass. Where does graviton fit in this picture? Also, in a zero Higgs universe, would there be a gravity affecting massless W’s or quarks as it affects photons in our universe? Thanks for your time. Gravity is quite separate — it Einstein’s theory, it interacts with energy and momentum, and (almost incidentally) it interacts with mass because all mass has its associated E= mc2 “rest energy” (or mass-energy as I tend to call it on this site.) So yes, in a zero-Higgs universe, gravity (and the associated graviton particle that it should have, in our quantum world) will treat photons, W and Z particles the way it treats all massless particles. Can you say more about the difference between chirality and helicity? I’ve always been confused why a neutrino-left does not become a neutrino-right with a lorentz boost ( assuming neutrinos have a small mass ). Not in a few words, and it’s too advanced for this part of the website. This is the sort of technical question I’d prefer to discuss in the Technical Zone. How come in Figure 3 you have not shown the direct interaction between the Higgs fields and the leptons and quarks? Thanks. Just because it would have made the picture a lot more complicated-looking. See Figure 4; imagine if I had put all the interactions on top of one another. I don’t think you could have read the figure at all. Someone on another forum asked how the Higgs particle acquired mass? That was a good question. I remembered this article and linked to it, but I got a detail wrong. You stated that the Higgs particle doesn’t get its mass from the Higgs field (there’s a correlation, but it’s indirect). How does the Higgs particle acquire mass, please? We don’t really know yet. We just know that it would be massive even if the Higgs field’s value were zero… and so not all of its mass can come from the Higgs field itself. But we don’t understand enough about the Higgs field yet to give a confident answer. You demonstrate that the process of the non-zero Higgs Field rapidly and repeatedly converting a top-left into a top-right and back again results in the (composite) top quark as we know it and gives it mass-energy; and you say that a photon is ALSO the result of the Higgs Field interacting with (and somehow combining) two particles (W3 and X). I understand that the (massless) photon differs from the (massive) weak force carriers in that the latter are composites that *include* Higgs particles while the former is a composite only of W3 and X, but if the Higgs Mechanism gives mass-energy to matter particles that are Higgs-less composites, why does it not do so in the case of photons? A related question, which might really be the same question phrased yet another way: given a non-zero Higgs Field, I gather from your article that the energy involved in interactions between top-lefts and top-rights is somehow “stored” in the composite top quark as mass-energy. If similar interactions between W3 and X particles result in a photon with no mass-energy, what happens to the energy involved in the W3–X interactions? At some point we’re getting to the edge of what we can do without some math. I don’t think I have a simple answer for you that doesn’t involve actually checking simple but necessary details of equations. These things are not obvious. For example, a different type of Higgs field can leave both the photon and the Z massless, while other combinations of Higgs fields can leave nothing massless. The W is a mixture of a massless W and a part of the original Higgs field; the top quark is a mixture of top-left and top-right. They are still point-like objects even though they are mixtures of point-like objects. The proton, by contrast, is a composite object, made from a number of point-like objects. It is not point-like; it has a size that you can measure. And you can make it vibrate; the excited states of the proton, like excited states of an atom, exist because the proton has a size. But I myself wasn’t actually confused about the point-like “mixture” of top-left and top-right that makes a top quark with the “composite” nature of hadrons; I’m not sure if knowing this changes how you might answer my question: if the top-left and top-right are massless but nevertheless “mix” to form a massive top quark with a non-zero Higgs field, why do similar(?) interactions between the massless W3 and X result in a massless photon? What happens to the energy involved in that interaction if it doesn’t become mass-energy? Does this eventually boil down to the difference between the physical nature of fermions vs. that of bosons? If the top quark’s energy is a summation of the top-right, top-left and the Higgs, then what is the mechanism that destroys the distinct characteristics of the three components and produces one indistinguishable “particle? What does this got to do the whether the Higgs field exist or not? Well, if the top quark is stable once it is produced then the Higgs boson is entangled within that space for as long as the top quark’s lifetime. Yet I have not read anyway that says the top quark interacts with any other elementary particle. Should not the entangled Higgs have some interactions (even through gravity) with other particles? If the combination process is irreversible wouldn’t that contradict the SM itself? Does the photon’s identity as a mixture of two more fundamental massless carrier particles, W3 and X, mean that the classical electromagnetic field itself can be characterized in the same way–in other words, could one write down classical field equations for the “hypercharge” and “isospin” fields, plus some classical description of the Higgs’ effect on the “hypercharge” field, and have Maxwell’s equations come out at the end? Could one plot out an “X-Ray” of a classical electromagnetic field showing its “hypercharge” and “isospin” innards, or is the mixing too fundamentally a QFT phenomenon for that to be a meaningful idea? The answer is yes to both questions. It is something you can largely understand in classical field theory, no quantum field theory required. I can probably explain it someday, thanks for asking. Then we should observe dispersion in gravitationally deflected light, more energetic, shorter wavelength photons pulled stronger then longer wavelength ones. Was that experimentally established? I am not questioning your statement, but I am curious, because I couldn’t find term “gravitational dispersion”. It is clear that information that I had previously picked up was wrong, but I’d like to understand *how* wrong. Many years ago it was explained to me that most mass could be “explained” through the inherent mass-energy of the particle’s interactions with its fields. The example used was the electron. It was explained that due to its (“rest”) interactions via QFT that there was an inherent non-zero self-energy of it’s “own field”, and that self-energy was very close to the mass of the electron (90-something percent of it). Other particles, like the quarks, have additional fields and thus have naturally higher masses. He then went on to explain that this works for many particles, but not all, and that to make up the rest of the mass one needs to propose that some particles also interact with another field, and that the self-energy of that interaction makes up the “missing mass” (no, he did not use that term). That field is the Higgs, and makes up a significant contribution of the mass differential between different types of quarks. So, if it’s not too much to ask, could you go into this a little more? Does the energy of interactions with other fields also contribute to the mass, or is this “just wrong”? And if it is just wrong, how does the electron end up with some mass even if the field is zero? I think that latter point is in the article already, but I think I missed it. Hmm. By the 1960s I think it was pretty clear that the idea that the electron’s mass might come from its interactions with other fields was inconsistent with the properties of the weak nuclear force. I suspect that what you were told was a popular explanation at one time but that people gradually came to realize that it just couldn’t work. With no Higgs field in nature, the electron will lose all of its mass. There’s actually a symmetry that forbids it. Hi Matt, thanks for the reply, and my apologies for this tardy reply. This may be simply a terminology issue, but the explanation I saw (which I can no longer find although it should be in Google Groups circa 1986) was that the basic “concept” was the same as I see for explanations of the Higgs – i.e., that a surrounding space-filling field was causing a sort of “drag” on the particles. The difference was that the space-filling field was the vacuum fluctuations of the particle’s field itself – in this case largely due to the virtual photons surrounding the electron (IIRC). When the particle is under acceleration, space-time effects make the particles on one side, for lack of a better way to put it, “more energetic” than the other. As a result, particles resist acceleration. The magnitude is in relation to their total self-energy – which is higher for things with color charge, for instance. In retrospect, the effect sounded surpassingly similar to the Unruh effect, which is why I remember this at all – when reading about the later I remembered the former thread and that kept it fresh in my mind since then. The brain is an interesting organ. Is this ringing *any* bells? I’m going to continue looking for the original post, but I don’t hold out much hope of finding it. Speaking of, have you seen a good introduction to technicolor? All the ones I have seen are by-physicists-for-physicists, I’d love to read one more on the level of this page. From what little I’ve seen on it, top quark condensate theories are very similar to Higgs, with the exception that they replace the actual Higgs boson with a quark condensate. Is that correct? Before this news broke, I was laboring under the impression that the Higgs was supposed to only explain the W and Z masses, but now I hear that all elementary masses result from Higgs interactions. Is it through W and Z interactions that all other particles acquire mass? Or do they interact with the Higgs directly? Or is this a silly distinction, the presence of the Higgs modifies the entire Lagrangian in such a way that creates quark and lepton masses and “coupling” in the Feynmann diagram sense of sharing vertices only makes sense about the minimum that the Higgs has redefined with its quartic symmetry breaking field? Am I making any sense at all?? The Higgs field is (or fields are) the source of the W and Z masses. One or more of these fields must also give mass to the Standard Model fermions — there is no way to do it without a Higgs field. And this comes through direct interaction with the Higgs field, not through W and Z interactions. I’m going to try to explain this in a post sometime in the next month, using very simple math; if you had a simple freshman physics course and remember just a tiny bit of it, you’ll be able to follow it. Maybe someday I’ll figure out how to do it for those who never had such a course. If you could kindly explain what mass is, and what a particle is, or give me some better analogies I’d be grateful. Sometime over the next few weeks I hope to write an article that will improve the explanations on this point, accessible to anyone with some freshman physics. Keep an eye out for it. I am missing something basic. If the Higgs particle creates the Higgs field and the Higgs particle is extremely unstable and rapidly decays, why is there still a Higgs field today if there are no naturally occurring Higgs particles? The Higgs particle does not create the Higgs field. The Higgs field allows creation of the Higgs particle, through “ripples” in itself. These ripples die out quickly, but that doesn’t mean the field is gone. It just means that ripples in the field don’t last very long. The oceans are still there even if waves in the ocean don’t last long. If a photon is actually a mixture of X and W3, does that mean that photon field does not exist? That what we call a photon field is in reality only an illusive result of mixing of more fundamental objects (similarly for Z particle etc.)? And more generally: does it mean that the really fundamental particles (fields) are X, W1-3, top-left, top-right, etc? And that our “everyday” electrons and quarks are not really fundamental (and their fields do not exist), since they are mixtures of something else? You say at the end of your article, which is by the way a very good one that the higgs particle which is the higgs boson takes a part of its mass from its own field interaction. the higgs boson interacts with the higgs field in order to acquire not all of its mass but a part of it. Could you please tell me why the higgs particle takes a part of its mass from its own field? in a higgs field with value zero all particles are massless except for the higgs boson. How do we know that the higgs boson mass when the higgs field is zero is not the same with the higgs boson mass with the higgs field is non-zero? Thanks so much! I have a few additional questions. Since the hypercharge and isospin force carriers have 0 mass in a world with a Higgs field with 0 vev, are the forces long range as in 1/r^2? Does hypercharge sort of act like the electrostatic force – i.e. like charges repel, opposite attract? Is there an analogy to magnetic forces? Are there magnetic monopoles too – is that part of the hypercharge charge? And what in the world does the isospin long range force do? Does it change particle “types” at a distance? And when it changes the “type” does it also change the hypercharge? So is there a “cloud” of hypercharge around all particles that varies as 1/r^2? Very curious! Instead of explaining the mystery, science has become part of the mystery. Hi Matt. You say here that the electron would be massless if not for the Higgs mechanism. However, on Wikipedia it says that it was shown in the late 1800s that charged particles were shown to be harder to accelerate than uncharged particles, therefore they have an (inertial) mass, due to electrostatic self-energy (and charged particles cannot therefore move at the speed of light). The article is vague though; it references a 2009 paper that calculates the electron self-energy due to electromagnetism , but doesn’t try to reconcile this with the Higgs mechanism supposedly supplying the entire mass of the electron. Can you clear up my confusion, and could charged particles in fact move at the speed of light (if they didn’t have Higgs masses)? After posting this question, I read Chapter 28 of Feynman Lectures (written in 1964); to summarize, he describes this as an unsolved problem: the production of radiation when a charge is accelerated demands that there is an electromagnetic mass, but there is no self-consistant theory, either classical or quantum. [If a point electron acts on itself the mass is infinite; but if it’s not a point then effects are predicted which are not actually observed]. Well, the tau doesn’t affect Feynman’s story. And so much for wikipedia. The wikipedia article is referring to a junk paper on the electron mass that’s entirely wrong. Obviously the author of the paper put that in… so forget what it says there, it’s just wrong. If there were no Higgs field, the electron is massless (actually two massless particles, left-electron and right-electron that have different properties.) you In that situation, it doesn’t matter how hard you calculate the electron self-energy; it will remain a massless particle. There’s no way to marry the left-electron with the right-electron using electromagnetism; that’s a mathematical theorem, not a speculation. In this sense, yes, Feynman’s concern from the 60s is resolved by Weinberg’s use of the Higgs mechanism to give the electron a mass. But only to a point. Because what remains behind is the hierarchy problem: why is the Higgs field’s value neither zero nor as big as you can imagine? If it were zero, the electron would not have the mass it does; if it were as big as you can imagine, you’d need to include the details of your theory of quantum gravity, and an electron would be a little black hole or a very massive string or something. This article raises so many questions for me.Let me see if I can word the intelligently. First, is there any reason that there *shouldn’t* be right neutrinos? The symmetry of left\right seems intuitive enough, but the neutrinos are there singly, which stands out. Second, the fundamental forces. 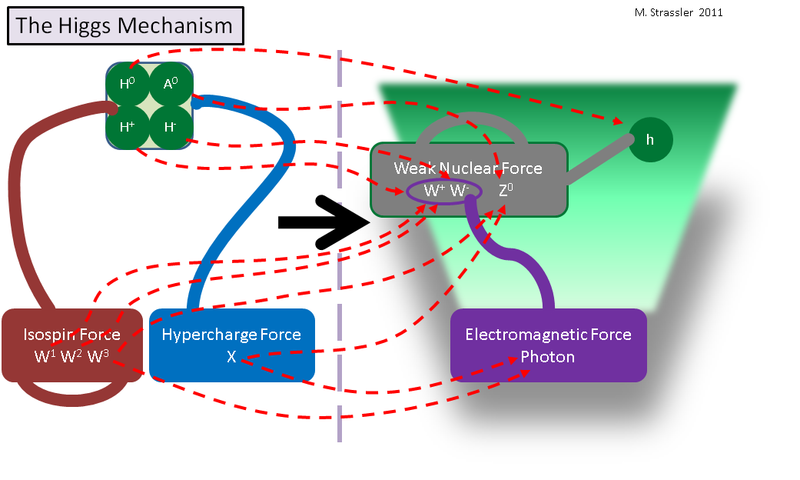 I’m taking it that the ‘isospin’ and ‘hypercharge’ are the ‘weak isospin’ and ‘weak hypercharge’ forces from my books. If I read this right, these two forces are mixed by the Higgs to produce the electroweak force (Four bosons that behave the same) that then experiences symmetry breaking to give us the electromagnetic and weak forces. OR am I wrong on both counts? Your first question is one that many physicists used to ask. But there is no left-right symmetry of this sort. The left-right symmetry that you are looking for is one that relates, say, left-electrons to right-positrons, and left-quarks to right-antiquarks. This is the particle-antiparticle symmetry that is a requirement for any quantum field theory. However, a symmetry that relates left-electrons to right-electrons is neither required by quantum field theory, nor is it even true until after the Higgs field becomes non-zero. Look at the figures; the left-electron is affected by the weak nuclear force (as is the right-positron, its anti-particle); the right-electron is not. And so your intuition is just misplaced. One question, prof, if the higgs field were to be zero, could it break the symmetry of electroweak interactions or will the symmetry remains unaffected? It’s a good question, and reflects the imperfect notation I’ve used. Yes, the superscript does reflect the charge, which is built into the structure of the theory. The W1, W2 and W3 may also be combined into charged and neutral particles, and maybe I should have done that… not sure why I didn’t. It is an artifact, really. The W+ in nature is a combination of W1 and W2: W+ = [1/&sqrt;2](W1 + i W2), where i is the square root of -1. And W- = [1/&sqrt;2](W1 – i W2). Finally, the Z boson is a slightly complicated combination of W3 and X, and the photon is another combination of the two. So I could in fact have labelled W1, W2 and W3 instead as W+, W- and W0, called X by the name X0, and then you would see their charges, and how the original massless W+ and the H+ combine to form today’s massive W+, the original massless W- and the H- combine to form today’s massive W-, a combination of W0, X0 and A0 form the massive Z0, and another combination of W0 and X0 form the photon. Matt : I want to understand more about the Higgs field, the mechanisms or process, at least at a descriptive level initially and based on any feedback I can then update my understanding and misconceptions to more accurate versions.
. There seems to be some key significance about left and right quantum entities which escapes me at present. Is this important in the understanding of the field interactions and the quanta. You suggest ( perhaps more than suggest) that the electron and other entities are mixtures of L and R, is this a topological feature and also partly explains the 1/2 spin of those entities, or at least the electron.
. I assume that the L and R quantum entities existed before the Higgs field became non-zero and when the Higgs field became non -zero it allowed certain L and R quanta to be effectively locked up together in an never ending quantum dance. Unless they decay or are part of other particle creation or disturbance events.
. Energy, what exactly is it ? how does nature actually do its book-keeping? In order to even suggest that it is a conservation Law. We as humans can in experiments, compare and measure after the event and it all adds up but nature cant do that ? I read your link on Energy, rest-mass, kinetic and interaction energy. In order to be conserved those properties must all be intimately related (defined as Energy, yes) even though they seem on the surface different however they must be released or transferred in a seamlessly way at a quantum level that all adds up.
. You say that a relativistic field needs no medium, I have difficulty in appreciating that, why ? because it does not have a physical basis?. Perhaps if it works I should just get over the non physical requirement? It would be wrong to think of the universe as a sentient creature that needs to be able to consciously measure and keep track of things. The universe is as it is and we see the results of it. Conservation of energy isn’t due to someone keeping meticulous records somewhere, but a natural consequence of how the universe works. Just as a clockwork clock doesn’t actually need to tell the time, but shows something we humans can use to do so, conservation of energy is just a natural, logical result of the various symmetries in the universe as it works. The L and R quanta as you call them were separate particles before the Higgs field became nonzero; they were totally unrelated, like the top quark and electron are today. The only connection they had was that they could be converted into each other via the Higgs field. We see similar situations today, in particle collisions. Even the names L and R are something we have given to the particles after the fact. Neither is an electron in any sense and we could easily call them bit and bob particles. They were not some sort of mirror image or even similar in properties, the only link was through the Higgs field, which was unimportant when that field was zero. But when the Higgs field became nonzero it made that transition between the two via the Higgs field far more obvious and important (to us anyway.) so that in our universe as it is you cannot have one without the other. Thanks for your response, I accept what you say, it was just so fascinating and interesting the way reality works that I was checking for confirmation really. I understand what you mean by L and R, bits and bobs,I was simply using the terms as given in the original article. However I still need to read some more, each time I update my views then re-read the same information I gain a little more insight, I just need to keep going. You have highlighted at least a couple of areas I need to explore more, symmetry, and more on the Higgs field, one small step for me. Hi, thanks again for all these information. My major’s biology but I find theoretical physics fascinating. I’m writing a sci-fi story, so I want to ask something. – If, for just a tiny moment, Higgs field were zero, would elementary particles rearrenge immediately? – And if mass were to drop so fast for a moment that it’s limit would be zero, would E=pc equation be acceptable? Sorry if my second question is silly. I know when measuring instant velocity we use limit and it gives the real velocity of the object, and therefore mass’ limit being zero could be mass being zero, but still, coul it be possible? It’s not zero in the end. If the Higgs field dropped to zero for a long enough time (And ‘long’ would not have to be that long on human timescales.) then yes, elementary particles would rearrange. (‘Immediately’ is not the best word.) They would re-rearrange when the field reverted back, I think the biggest effect would be electrons becoming somewhat randomized, severely disrupting all atoms in the vicinity, but would have to check this. If mass were low enough it could be ignored (Like we did with neutrinos for quite some time.) and we could calculate the energy of a particle as we do the photon. Thanks for the answer, it’s very helpful for me. I hadn’t thought it would be on human timescales either. By the way, it’s not related to topic but are you intrested in theoretical physics as a hobbyist? You seem to know much. I’m interested in science as a whole. This gives me a broad pool of knowledge (Which sadly is rather shallow in places.) My vocation is crystallography, but physics is deeply satisfying and I have had a number of paradigm changes while on this site. I will be looking for tips on the best way to increase the volume of remarks without any help blog, how have you reach your goals in achieving this? In this and other articles you reiterate, that “gravity pulls on things proportional to their energies”, which I do think to have understood pretty alright. However, current cosmology states, that our universe does mainly consist of “dark energy” and “dark matter” and only to a small amount of visible ‘baryonic’ matter. What I do wonder now, is how can we distinguish b/w dark “energy” and “matter”, when on long scales of the universe only gravity rules, which just pulls proportional to their energies – no matter(! pun not intended) whether this is comes from ‘matter’ or ‘energy’? So, what would in the end be the difference b/w the two dark things, if we do not have any clue, what they are made of anyway? Second questions would go to recent papers (e.g. http://arxiv.org/abs/0808.3283) stating that decay rates of certain radioactive elements show seasonal variations exhibiting an almost perfect correlation with the distance b/w earth and sun. According to my knowledge, there is currently no explanation as to the root of this effect? As radioactive decay is governed by the same strong and electroweak interactions inside the nucleus, that are probed to such high accuracy in particle physics, do you see any implications for ‘new’ physics from those findings for your area of interest? I would be grateful for any answer your time would allow you to give to these questions and will be happy, even to just be pointed to some further readings, in order to help myself in trying to understand these things better. Distinguishing between matter, dark matter and dark energy is interesting; on the largest scales of the universe there are two competing forces at play, gravity, which attracts everything with energy, and pressure which attempts to make certain things expand. While all ‘energy’ experiences gravity in the same way, Certain types of ‘matter’ experience pressure differently. Notably everything in the universe follows this equation, p = w*d; where p is the pressure, d is the density and w is known as the “equation of state”, though that’s more appropriate for the whole formula. The value of w is what is important, for ‘ordinary’ and dark matter it is nearly 0; for things like neutrinos or photons moving at c it is 1/3. In chemistry class, you may have learned the ideal gas law; if we write d as the number of moles divided by volume, then w depends only on temperature. In other words, the ideal gas law is another version of the same equation, covering the case when temperatures and densities are relatively high. But for dark energy w is negative. (Precisely what negative value it has we’re trying to find out.) The more it expands, the higher pressure it has, which means more expansion… The very fact that our universe’s expansion is accelerating means it is dominated by something that cannot be ordinary ‘matter’ in any form. This lets us distinguish dark energy and ‘everything else’ though it does not tell us precisely what dark energy IS. Of course this explanation is rather simplistic, there are far better articles out there. Dear Kudzu. Many thanks for your reply – this helped me already a *lot*, as I had not yet understood the role of pressure vs. gravity on cosmic scales. As always – every good answer creates a wealth of new questions. I would be grateful, if you could help me further out with the following point regarding the negative value of w for dark energy. How did we come to know, that w is negative for dark energy? Is this something *given* by first principle? Or was it the other way around, in the sense, that we measured the universe’s expansion to be accelerating and then concluded, that there must be something, that we can put into equation p = w * d, so that an accelerating expansion of the universe can be explained and this required w to be negative, so we call the thing out there with the negative w “dark energy”? In that case it might as well have been given some different name, like “dark pressure”? The second case is true. For most of last century it was believed that the universe’s expansion must slow, possibly enough to cause the universe to collapse in on itself, possibly not. The observation that the universe’s expansion was accelerating was the total opposite of what was expected, and for some time was thought to possibly be a mistake. certainly one of them in in excess of a yr.
lose weight fast and healthy hoping the ambiance, ease as well as availability of the solutions currently being opened from 5:00a. My site has a lot of unique content I’ve either created myself or outsourced but it appears a lot of it is popping it up all over the internet without my permission. Do you know any techniques to help prevent content from being ripped off? I’d definitely appreciate it. Longtime lazy reader here. I was planning to thank you for this great site for at least a year, then I had all sorts of confusions I wanted to post as questions. I guess you got enough of both so nothing of value was lost. In the last sentence of that paragraph you write ‘Take the Higgs field away — make it zero — and the top quark goes back to being two separate massless particles, the top-right and top-left’. This puzzles me as according to the explanation given I’d expect top quark to go back to being one massles top particle, either left or right. hi, Matt, brilliant article there. I have one question here, we know that an electron and muon are same in mostly all respects except their mass, so if we provide energy to electron equal to the mass of a muon, then, due to E=MC^2, can we say that energy has been converted into mass, and we can treat it like a muon? or that its number of interactions with the higgs field have increased? No, you cannot do this. The “mass” I refer to here is the “rest mass” of the particle. There is no way to put energy into an electron without it responding by moving… and then what you have done is change its motion-energy (“kinetic” energy) without changing its rest mass. Alternatively, if you put lots of energy in but insisted the electron stay stationary, you’d just make lots of photons and lots of electrons and positrons in pairs. The energy would not go into the stationary electron. There is simply no way to change the rest mass of an electron. The idea here is that the rest mass of an electron is closely similar to the vibrational frequency of a tuning fork; it’s a resonance. You can’t make the tuning fork vibrate faster by putting more energy into it. You’ll either make the tuning fork fly across the room, or you’ll make it ring louder — but it will ALWAYS vibrate at the same frequency. In Leon Lederman’s book “Beyond the God Particle”, he explains the flip-flop of a quark or lepton between left and right as follows: Left particles have a “weak charge”, which is conserved, just like electric charge, but right-particles do not. So when a left-particle flips into a right-particle, it dumps its weak charge into the Higgs field, and when it flips back, it pulls a weak charge out of the Higgs field. Is this weak charge he refers to actually the third component of the weak isospin (T3)? If so, what is the value of T3 for the Higgs boson itself? When the massless bosons and the four Higgs particles combine to form the W, Z and photon, what is going on with the T3 values? Yes, after the Higgs field gets an expectation value, the T3 value is what Lederman calls the “weak charge” that is constantly changing. Indeed the electron is the marriage between particle that has T3 = -1/2 (the electron-left) and one that has T3=0 (the electron-right.) So what that tells you is that after the Higgs has a non-zero expectation value you simply cannot keep track of the T3 values at all. The W+ starts off with T3 = 1, but absorbs a part of the Higgs field that has T3 = +1/2. The W- does the same, just with minus signs. The Z starts off with T3=0, and absorbs a part of the Higgs field with T3=-1/2 and part with T3=+1/2. And the Higgs is in some sense part of the Higgs field with T3=-1/2 and part with T3=1/2. As you can see, that’s confusing. It’s better to realize that T3 just isn’t a good quantum number anymore and you shouldn’t use it. The vacuum can absorb or spit out as much T3 as you’d like. Similarly, if you’re looking at physics in a crystal where rotational invariance is broken, and you try to keep track of where angular momentum is going, you’ll get very confused. I may have misunderstood something but since e_L (T3=1/2,Y=-1) is interacting with the Higgs field condensate which has the quantum number T3=-1/2 and Y=1, you can see the e_L e_R “oscillation” as if e_L gives a “charge” T3=-1/2 and Y=1 to the condensate to become e_R (T3 =0, Y=-2) and the other way around. In that sense, we can still keep track of the isospin third component or the hypercharge. For the Z, you said that it absorbs a part of the Higgs field with T3=-1/2 and a part with T3=+1/2. I’m not sure I understand. For T3=-1/2, I suppose you refer to the absorption of the Higgs field degree of freedom giving the longitudinal component of the Z (and hence its mass), but what about T3=+1/2? What puzzles me is that T3=+1/2 corresponds in the Higgs field SU(2) doublet to a charged Higgs. These 2 degrees of freedom are absorbed by the W+ and W-, not by the Z as far I as know. Don’t hesitate to tell me if I mess up everything! How is it that the value of the Higgs field has remained the same even though the universe has been expanding? Yes. The fact that the Higgs particle is so heavy gives strong theoretical evidence: an simple expanding universe at temperatures that are much lower than the Higgs mass-energy should not affect the Higgs field. And we can check that experimentally; the properties of atoms from 13 billion years ago are the same as the ones we have now, as we can tell from the energies of the photons that they emit, so the particles of nature have not changed their masses during that time by more than one part in … hmm, I think it is probably one part in 10,000 (and even less in the last 2 billion years), but I haven’t checked the number recently. Anyway, there’s no sign of even a tiny drift in the value of the Higgs field, and we wouldn’t expect one. Yes! Finally something about entitle. the submit, we’d like work out extra strategies on this regard, thank you for sharing. Can you please share a link through which we can find more information on this subject? Mmmmm… I’m a graduate student in experimental particle physics. I don’t know what else to say… You tell me if this is sufficient. The point is that you add to the Standard Model non-renormalizable terms — (1/ M ) (L H) (L H), where L is a lepton doublet with a neutrino and a lepton [left-handed], and H is the Higgs. When the Higgs gets an expectation value, this leads to Majorana neutrino masses, (v^2 / M) \nu \nu. You can read about Majorana neutrino masses many places; they are in standard textbooks and in any review on neutrino masses. What’s not always in there is the fact that, within the Standard Model with a Higgs doublet but no exotic Higgs triplets, you do need the SM Higgs expectation value in order that these masses can exist. Sir,can u just tell what would be the mass of electon if it approaches 99.99% of light. * I mean 99.99% speed of light. where m_electron is the electron’s mass (what some call its “rest” mass), 0.511 MeV/c^2 . So the “relativistic mass” of the electron is E/c^2 = 36 MeV/c^2. Said better, the energy of an electron at 0.9999c is roughly 70 times more than the energy of an electron at rest. hi. an extremely informative blog here. Just had a question in mind. In one of Richard Feynman’s theories, it is that an electron-positron collision is simply an electron going forward in time giving energy equal to energy of both of their energies, then goes back in time and is seen as a positron. Now, if see this from the electron’s view, it went to the collision spot, gave off energy more than it had (equal to both , the electron’s and the positron’s energy), and went back in time. So at the collision spot it gave off more energy than what it had. So, this violated the conservation of energy and so to get the energy it had lost it went back into time. So, at the point of collision, we can say its energy went into a negative state ( i.e energy less than 0 ), so it went back in time. Hence, we can say A PARTICLE MOVES BACK IN TIME ONLY WHEN IT IS IN A STATE OF NEGATIVE ENERGY, OR WHEN IT LOSES SPONTANEOUSLY MORE ENERGY THAN IT HAS. If we view this from the point of view of Dirac’s sea, we can say it loses energy, goes into a negative energy state, so knocks off the particle in the sea, occupies its spot, and the knocked out particle is viewed as the positron. Now, since the spots in the Dirac’s sea must have been filled quite early after the big bang, and the knocked off particle is an antiparticle, does it mean that early in universe there much more antiparticles than particles, but they then quickly occupied the spots in the Dirac sea, and this reduced their number in the observational universe, because of which CP violation took place. My question is, are these viewpoints(hypotheses) right or even half-right? Please make them right if wrong and use some basic maths in the upper one. Thanking you in advance!! Sir, please reply to my above question. Matt my man. I have some burning questions about this article concerning the hypercharge force and iospin force. Are the 3 w particles for the iospin and the x particle for hypercharge really new particles with there own quantum fields? Or are they just a different chirality of another particle. And if these force carriers are completely new particles then why are they not on the standard model? 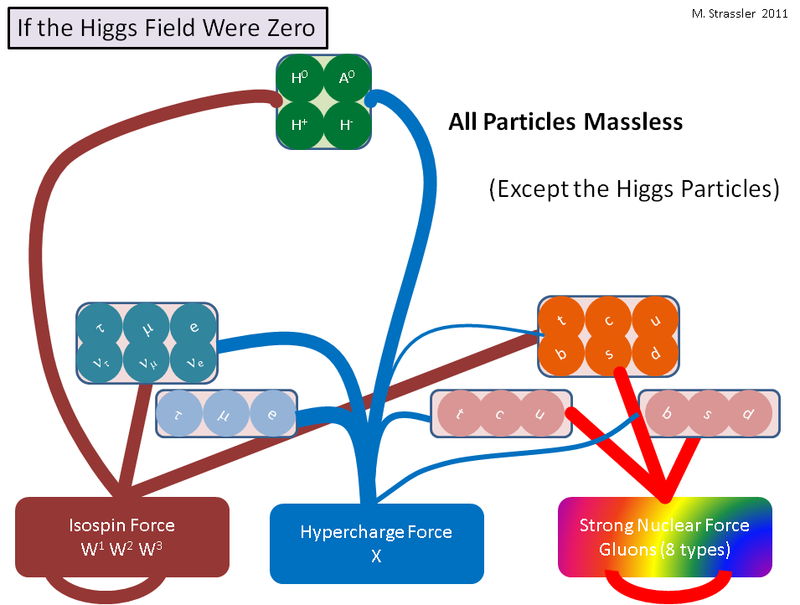 Also why are there four higgs? Are the four just a different chirality of two more fundamental higgs?Or are they all completely fundamental? And one more simple question. If the four higgs are really all four different particles with there own quantum fields then is it only the one higgs field that is non-zero? I would very much appreciate it if you would reply. Thanks for sharing your thoughts on software to create explainer videos. baby showers brings friends and relatives together offering a emotional support to the parents and celebrating the occasion with gusto. learn what it is with your guests or just surprise your guests. Invitations can be pricey, so this is a great place to save money. with other food or beverage. So the electron mass arises from the Higgs field. Is there an equation relating electron mass to properties of Higgs field? Has it been experimentally verified? The parent or guardian should visit Family Safety website and then remove the monitored accounts. the Million Dollar Round Table (MDRT), and numerous life insurance companies, brokerage firms and trade associations. Possible dimension arrangements: 11 to 12 feet in width, 15 to 16 feet in length (165 to 192 sf). Tucked in are lists of family friendly books subjects, recipes, and games to extend learning. I need to tto thank yyou for this fantastic read!! So you don’t really need any discipline with this one. But don’t worry; there’s a solution for every problem. In their world, getting older can mean getting less work. game engine to create a simple platform game. your post onn AOL? I require an expert on tthis area to solve my problem. Great article! Could you, or did you write a similar one: What would the quantum mechanics look like if c was infinite? Wow, and i thought i knew particle physics. Everything on the internet about this kind of stuff is noninformative and misleading, meanwhile some websites do not explain anything to you at all and very confusing, however this is perfect! Thank you for spending your time on magnificient articles! Do you perhaps have an article about electronuclear theories/GUT? So how do we resve this theorum with the revalation that particles have no mass until they are observed? Does the Higgs field interact with our brains, which tells the higgs field the information we are percieving then commanding the field to give mass unto the particles? Still a work in progress? Higgs field is much more profound than we know to day. May be five god particles flowing at a speed much higher than speed of light detected in 2015 LHC run will explain many of our questions to day as explained in balloon inside balloon theory. As a casual observer of physics, I have trouble understanding why gravity being the weakest force has infinite “reach” with very light force conveyance particles and conversly, the strong force between massive protons and neutrons is active only over tiny distances on the order of nucleus. How’s that for a run-in sentence? Standard model prescribes gravity infinite range fundamental force predicting mass less gravitons with spin2. But gravity is emergent force due to directional push of massive gravitons on matter. One calculation shows mass of a graviton is 750 proton mass. Therefore graviton in itself may be regarded as dark matter. Gravitons are non isotropically distributed due to centrifuging action from rotation of galaxies. Gravitons flow like arrows to wards center of earth varying its presence at point by a factor 1/R.R . R is distance from center of earth. Force of gravity gradually grows stronger towards center of earth by a factor 1/R.R. Acceleration due to gravity is not exactly constant . Equivalence principle not exactly correct. We may for calculation purpose can revise… F=P.G.M.m /R.R . We can now explain galactic rotation curve without invoking dark matter. Calculation also predicts that M/R.R for any molecule is constant to justify Avogadro Law and chemical reaction. M is mass and R is radius of any molecule. Therefore gravity has no potential in space of infinite range , neither gravitational waves. LIGO observations are simply ripples in gravitoetherton super fluid and wrongly predicted as garavitational waves by Einstein. So, let me propose a thought experiment. Suppose a golfer happened across a device that could suppress the Higgs field just inside a golf ball. he turns the device on and aims it so that the golf ball loses the mass of its core, only the plastic covering has mass. he then tees off with his 3 wood. When the 3 wood contacts the side of the golf ball it has normal mass and velocity. as it passes through where the ball was it passes through the volume where the Higgs field has been suppressed. As the ball moves off the tee it passes out of the area where the higgs field is suppressed as the club enters it and loses mass. What happens, if anything, to the golf ball? Hi Matt – The graphics titles “If the Higgs field were zero” should perhaps be called “When the Higgs field was zero” (Since, if I understand inflation rightly, the idea is that Higgs was zero for about 10 to the -37 seconds way back at the start.). Should have been some interesting physics. If a particle only can be said to exist if it possess energy, if it only can interact with the Higgs field if it has energy and energy is a source of gravity (if it can be localized), then it already (acts as if it) has mass, so what would it need the Higgs field for? If a particle only can be said to exist if it possesses energy, if it only can interact with the Higgs field if it has energy and energy is a source of gravity (if it can be localized), then it already (acts as if it) has mass, so what would it need the Higgs field for? How on earth do you know about the isospin and hypercharge forces? The higgs field ISN’T zero, so how can you figure out what the world would be like without it? Is there some way to get higgs particles out of a certain area so that you can look at the results? What would happen if the electroweak transition temperature is exceeded then? Particles can be produced by the theory that mass emerges from electromagnetic and gravitational waves interacting via vector-tensor-scalar geometry. The vectors of photon and graviton (the waves’ excitations) are represented by two adjoining sides – one horizontal, one vertical – of a parallelogram as well as by their resultant diagonal. When changing from the coordinates of the sides and diagonal to those of a single, scalar^ point on the diagonal; tensor calculus requires transformation in a precise manner. In this case, quantum spin will be addressed and the calculus begins with Stephen Hawking’s observation that “What the spin of a particle really tells us is what the particle looks like from different directions.” (1) Like an arrow with one tip pointing upward, the spin-1 photon must be turned one full revolution (360 degrees) to look the same and again be pointing up. Like an arrow with two tips (one pointed up, one down), the spin-2 graviton must be turned half a revolution (180 degrees) to look the same. Its constant interaction with the photon means it turns two half-revolutions while the photon turns one revolution. The half of the diagonal representing the photon can be assigned the value 1 while the half portraying the graviton is ½ + ½. ^ A scalar quantity is completely described by its magnitude, is without direction, and is associated with spin-0 particles. It is representable by a position on a line which, in the diagram above, is the central blue and black dot on the diagonal. Matter and antimatter can exist because division is the same as repeated subtraction e.g. 4 subtracted from 20 five times equals zero, therefore 20 ÷ 4 = 5. Instead of repeating the subtraction used above,^ the photon’s spin is divided by the graviton’s spin and this leads to production of matter particles of spin 1 / 2. (In terms of Stephen Hawking’s observation that “What the spin of a particle really tells us is what the particle looks like from different directions”, the quantum spin of matter particles is 1/1 divided by 2/1 ie 1/1 multiplied by ½ = 1 / 2.) In other words, photon-graviton interaction forms the emergent property of mass (just as hydrogen-oxygen interaction produces wetness) and if the mass emerging from photon-graviton interaction is 125 GeV/c2 (with spin 0), the Higgs boson becomes a by-product of the former interaction (relating the graviton to the supposedly unrelated Higgs boson, as well as the gravitational field to the allegedly unrelated Higgs field). The photon must interact with the graviton to produce the mass of the weak nuclear force’s W and Z bosons. To produce their quantum spin, the photon’s spin 1 needs to react with the graviton’s spin 2. That is, the photon’s turning through one complete revolution needs to be combined with the graviton’s being turned through two half-revolutions. Incorporating the time factor as a reversal of time^ in the middle of the interaction: a gravitonic half revolution is subtracted from the photonic full revolution then the graviton’s time-reversal adds a half revolution (1-½+½ = the spin 1 of W and Z bosons). The W+ and W- each have masses of approx. 80 GeV/c2, the Z’s mass is approx. 91 GeV/c2, and the Higgs boson is approx. 125 GeV/c2. The particles absorb energy from the virtual particles^^ filling space, time, and matter as they travel or vibrate. Since virtual particles produce mass and photons and gravitons interact to produce mass, virtual particles could be the building blocks of photons and gravitons.